All this sounds like an Old School Renaissance adventure for the retroclone of your choice—and it is. Not the retroclone what you were thinking of though, for Adventure Module M1: The Terror of Ettinmarsh is written for use with Classic Fantasy: Dungeoneering Adventures, d100 Style!, the supplement for Mythras which is designed to do Dungeons & Dragons-styleadventuring with a percentile mechanic, a stronger emphasis on skills, and the use of passions. Published by The Design Mechanism—and available in the United Kingdom via Aeon Games—Adventure Module M1: The Terror of Ettinmarsh is designed for characters of Rank One and Two. It is intended as an introduction to the world of Greymoor, the setting for Classic Fantasy adventures—surely a nod to Greyhawk, one of the original Dungeons & Dragons campaign worlds, but noticeably does not include a great deal in the way of background about that setting. Instead the given background is very much focused on supporting the set-up for the adventure and its sequels. Adventure Module M1: The Terror of Ettinmarsh details just three general locations. The first is the village of Anminster, the second is the adjoining tower where Lord Anminster resides, built atop the ruins of an old Dwarven tower, and a five level dungeon below his tower. One indication of the ‘high magic’ nature of the setting is that the village has a shop where potions can be brewed and bought and a shop where magical items can be bought and sold. Their inclusion breaks any sense of naturalism there might have been to the adventure. It might have made more sense if the village population was larger and there was an obvious source for these magical items. Half of the adventure is devoted to detailing the dungeon below Lord Anminster’s tower. In fact, this dungeon is not so much a dungeon, but an inverse tower built into the rock—and below—upon which Lord Anminster’s tower stands. This is an ancient dwarf fortress, which served as both the home of garrison which provided protection for travellers through the Ettinmarsh and hid a darker secret at its lowest reaches. The halls, rooms, and barracks of this inverse fortress have long been abandoned and access hidden, but the latter will be revealed shortly after the start of the adventure. There is actually little to be found here, but there are clues to be found which hint at what the fortress is really protecting. 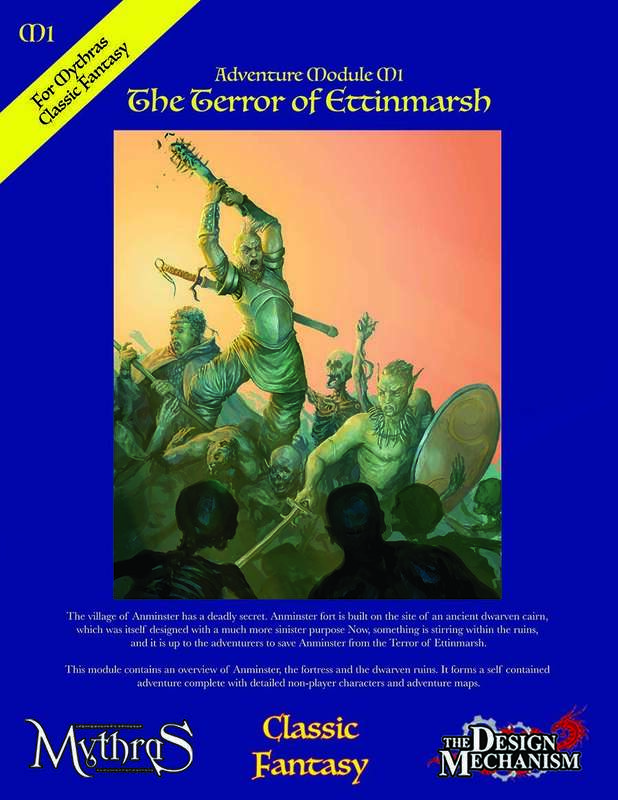 Adventure Module M1: The Terror of Ettinmarsh feels as if a bait and switch has been pulled on the players and their characters since it does not focus on the bandits and the surrounds of Anminster as its set-up suggests. In fact, that focus is the subject of Adventure Module M2: Moonspike Tower, the sequel to Adventure Module M1: The Terror of Ettinmarsh, so the Game Master and her players will have to play through both scenarios for the suggested set-up to be fulfilled. One issue where Adventure Module M1: The Terror of Ettinmarsh does feel threadbare is in its rewards and if there are few magical items are to be found, then perhaps a little more money could have been included so that the player characters could spend their rewards at ‘ye olde magik shop’ in the village. Physically, Adventure Module M1: The Terror of Ettinmarsh is cleanly presented. The scenario is light on artwork, but the writing is decent. The production values could have been a little higher though, a card cover instead of a paper one, for instance. The main issue with the module is that the maps are just a little fuzzy and could have been better handled. They are just about legible though. There is an air of familiarity to Adventure Module M1: The Terror of Ettinmarsh, but that is rather the point of Classic Fantasy: Dungeoneering Adventures, d100 Style!—doing styles of adventure that are familiar, but with more detailed roleplaying rules. 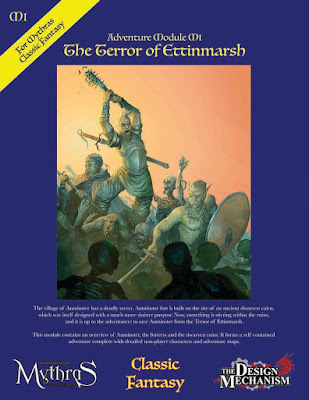 Overall, Adventure Module M1: The Terror of Ettinmarsh delivers a decent mix of combat and roleplaying, but comes up trumps in providing a problem which requires neither. Beyond Adventure Module M1: The Terror of Ettinmarsh, the Game Master will have to either develop further adventures of her own or run Adventure Module M2: Moonspike Tower. Either will provide a good base from which a party can go adventuring.